Directions: The Buck's Branch Creek tour stop [ Waypoint = N37 14.153 W94 19.546 ] is located on Civil War Avenue about 2.25 miles south of the previous tour stop. Drive south on Civil War Avenue. You will stay on Civil War Avenue crossing first Nutmeg Road and then Maple Road. Buck's Branch Creek is approximately 0.4 miles south of Maple Road on Civil War Avenue. Pull off on the side of the road. Description: This stop on the tour places you at the Buck's Branch Creek ford where the Missouri State Guard Cavalry had deployed in order to prevent the Federal troops from escaping. 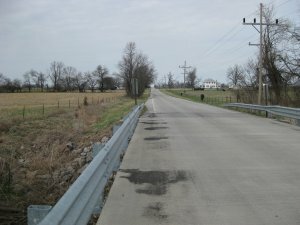 As Lieutenant-Colonel Francis Hassendeubel approached to within a half mile of Buck's Branch Creek he knew it would be a dangerous place to cross. The wagons would have to go in single file because of the marshy land on either side of the creek crossing. This would take time that he did not have. Compounding this problem was what they discovered when they got closer to the creek. There were troops of the Missouri State Guard in line of battle along the creek crossing. The Missouri State Guard Cavalry had arrived ahead of the wagon train. The time was around 1400h. I crossed Bear [Dry Fork] Creek, and after the second engagement between our artillery and infantry and that of the enemy I got in front of the enemy, and formed my command on the north side of Buck Branch, in conjunction with Colonel Brown, commanding First Regiment Cavalry, Sixth Division Missouri State Guard, when another short engagement ensued, but Colonel Weightman coming up with his artillery, the enemy again retreated. Meanwhile the two large bodies of cavalry had completely surrounded us, and had formed into line against our rear. They were posted behind a small creek, called Buck's Branch, which we had to pass. To meet them, I left the position on Dry Fork [to move] against the cavalry. [Sigel] ordered the battalion of Lieut. 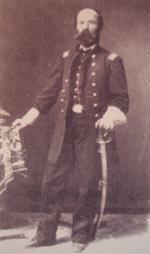 Col. Hassendenbel, and 2 guns under Lieut. Schuetzenbach to dislodge this cavalry, the infantry marching through the prairie in columns of companies to within about 1,000 yards of the enemy, when Schuetzenbach on our left opened fire on the cavalry, whose heads were just visible over the banks of Buck's Branch, while Lieut. Col. Hassendenbel was deploying his battalion to advance in line. Colonel Franz Sigel galloped up and the following conversation took place. Behind [us I left] two companies acting as a rear guard against the main body of the enemy, moving from Dry Fork. After one round of our whole line, the infantry moved in double-quick time towards the enemy [on Buck's Branch Creek], and routed him completely. His flight was accompanied by tremendous hurrahs of our little army. Lieut. Col. Hassendenbel . . . turning to the battalion commanded “Forward!” “Double quick!” “March!” . . . We ran about 500 yards when the want of breath stopped some one, and he fired his gun; this, of course, brought on a volley and in an instant the whole prairie in front of us was covered with fugitive, mounted men, running away from us at the top of their horses speed, circling back the way they had come and rejoining their line; only one unfortunate captain, whose horse had been killed, was captured by us. The Missouri State Guard Infantry continued to pursue Sigel's forces. By the time they reach Buck's Branch Creek, they could see that the wagons were on their way to Carthage. Sigel had set up his artillery batteries to protect the rear of his wagon train. 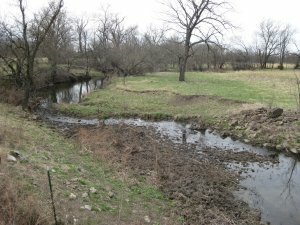 Sigel's next key task in his retreat was getting across the ford into Carthage at Spring River. By this time it was 2 o'clock p.m. The entire brigade, with the exception of Colonel Graves' command, had been marching since 4 o'clock a.m. (Colonel Hurst's regiment without breakfast), and I was proceeding to encamp the brigade upon the ground recently held by the enemy, the scene of their victory, when, learning that Colonel Rives, of General Slack's command, with his regiment of cavalry, had engaged the enemy and needed support, I again called upon my wearied brigade to advance, to which they promptly responded; but the enemy before our arrival had again retreated.